Arsenal manager Unai Emery has called on star playmaker Mesut Ozil to add more goals to his game as one area he can improve in. The Spanish tactician replaced Arsene Wenger at the Emirates Stadium this summer and has inherited a challenging job with a rather unbalanced squad of players. There is plenty of talent in this Arsenal team but getting the best out of them will be no easy task, with Ozil one of the most puzzling players of all. The Germany international has long been regarded as one of the finest creative players in the game, though he does also have the tendency to disappear in big games and not contribute as much as a player of his reputation perhaps should. 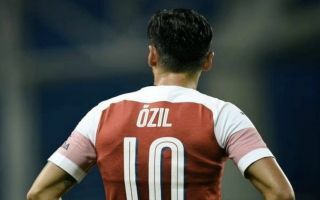 Emery admits Ozil could contribute more to the team, and has highlighted his goal return as something he’d like to see improve. Speaking ahead of this weekend’s game against Newcastle, the Gunners boss admits he wants to see Ozil getting into the box more to boost that goals tally. ‘I want to find with him the possibility to do more near and in the box to score,’ Emery is quoted in football.london. ‘Professionally I push him for improvements to give us the best in his qualities and performances.